This is definitely not a book I would have picked up in my own. It took me a long time to read it. It’s not that it was a difficult read, but there were many moments where I had to put it down and then re-visit later. As a young girl living in Somalia, Ayaan was subjected to genital mutilation and constant abuse from her mother. Although both practices were considered the norm for a Muslim upbringing, it still weighed heavily with Ayaan. She understood what was expected of her, but very early on she did not agree with how things were carried out. As Ayaan was growing up, relations between her mother and father became difficult and he began to take other wives outside of the home. As her father’s favorite, Ayaan tried to understand her father’s ways, but also felt loyal to her mother, even though her mother treated her so poorly. Ayaan’s brother and sister dealt with these issues also, but not to the degree that Ayaan did. Ayann, influenced by Harlequin romance novels becomes infatuated with the idea of “love”. Her friends and cousins tell her otherwise. That there is no love, just pain and a duty to do right by your husband. Ayaan, determined to prove them wrong, makes a mistake that ends up changing her life forever. Thus begins her quest as a humanitarian and women’s advocate. I won’t say anymore about her story because I know a lot of you plan to read the book but I have mixed feelings about the book. Much of the book is Ayaan’s life as a young girl. I enjoyed this part, even though some of it was disturbing to read. What really affected me was her relationship with her mother. I understood her mother’s frustration, but her anger was entirely misplaced at times and it was frustrating to read these accounts. There were several instances where Ayaan made decisions that were totally rash and without thought. I had to remind myself many times that she was a young girl. I guess you could say that I expected her to be a bit more “streetwise”, for lack of a better term. There were a couple of times where I found myself not liking her. One time in particular, where her honesty is questioned, although I could totally understand why she did what she did. As for the writing, it took me about 50 pages to get into it and then it was about 75 pages too long. To me, the last quarter of the book was difficult to read. It seemed to go on and on, yet also jump forward without a lot of detail in between. For example, there were only a few pages on 9/11, yet that event had such an impact on Ayaan that it forced her to denounce Islam. I think the book would have been more balanced if more time had been spent telling the readers about her experience in Parliament than some of the events leading up to it. Overall, the book was fascinating and forced me to evaluate how people live in other countries. Ali went on to establish the Foundation for Freedom of Expression and is an advocate for women’s rights. 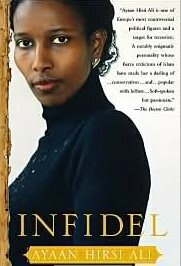 If you’d like to read more about Ayaan Hirsi Ali, click here to vist her web page. To read what the N.Y. Times had to say about the book, click here. My book group has not met yet to discuss the book but I am sure there will be a lot to talk about. Wow! Great review. I get a sense of how powerful the book is from it. I appreciate your honest review. I bet you will have a good discussion about it! We discussed this in a book group a few years back. I’ve recommended it to a few people who like memoirs. I thought the writing about her childhood and early adulthood was strongest. Things went on “fast forward” toward the end of the book, and that part didn’t hold my interest because it seemed more of an outline than a cohesive narrative.